When cutting steel, Qsaw blades will leave a workable finish, our carbide blades run cooler and with few sparks. Qsaw Industrial Circular Saw Blades are designed to deliver the highest performance in the industry. We use the highest grade carbide, precision laser cut blade bodies & state of the art industrial brazing. This makes for a premium blade designed for industrial use and to increase productivity. Qsaw Cuts Cooler, When cutting steel, Qsaw blades will leave a workable finish, our carbide blades run cooler and with few sparks. Qsaw Lasts Longer, other carbide and Abrasive blades wear down quickly. The Qsaw Carbide Circular Saw Blade can last as long as 20x or more than other products. Qsaw Cuts Accurately, other blades can to flex and "walk" during a cut. Qsaw uses a laser cut blade body that is designed for accuracy and precision. Ideal For: For Heavy-Duty General Purpose Applications. Crosscuts (3/4" to 3-1/2") & Rips (1/4" to 1" ). This heavy-duty thin kerf blade is good for crosscutting thick hardwoods and softwoods and thinner stock materials. The ideal working range is from 3/4" to 3-1/2" thick for crosscutting, and 1/4" to 1" thick for ripping. Thinner or thicker material may be cut, but some loss of surface finish may occur. Ideal For: Heavy-Duty Ripping Blades For Underpowered Saws. Depth of cut (3/4" to 2-3/4"). This blade gives new life to underpowered table saws and radial arm saws because the thin kerf does not require much horsepower. The Perma-SHIELD™ coating helps this blade pull 1/3 less on the saw, which translates into over 33% more cutting power. The ideal working range is from 3/4" to 2-3/4" thick. 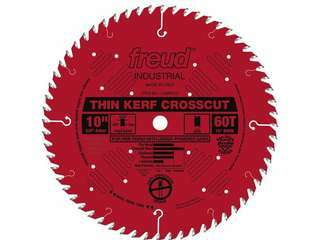 Ideal For: Crosscutting Blades For Fine Finish With Underpowered Saws. Depth of cut (1/2" min to 2-3/4" max). This Perma-SHIELD™ coated blade gives new life to underpowered saws and produces smooth crosscuts in hardwoods, softwoods and moldings. Coated blades pull 1/3 less on the saw, which translates into 33% more cutting power. Thin kerf blades remove less material than standard carbide blades, thus requiring less horsepower to produce equally good results. Ideal For: Fine Finish Blades For Sliding Miter & Radial Arm Saws. This thin kerf industrial blade provides a superior finish cut with sliding compound miter saws. The 5° negative hook angle helps prevent the blade from being too aggressive and pushes the work piece down and towards the fence. Make clean cuts in hardwood, softwood, plywood and medium-density fiberboard (MDF) with the Avanti PRO 10 in. 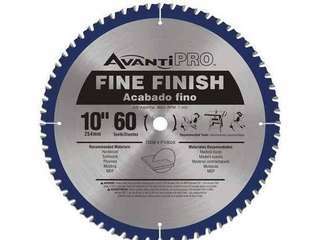 x 60-Tooth Fine Finish Saw Blade. This was designed specifically for professional contractors. 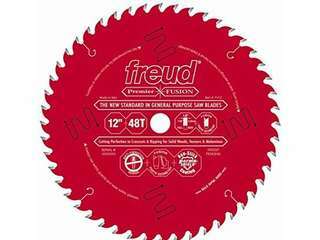 This blade has a thin kerf edge and friction-reducing rim coating to resist binding and drag. The durable carbide reinforcement extends the life of the blade. Ideal For: Crosscuts (3/8" to 3-1/2") & Rips (3/4" to 1-1/2") wood, laminate, veneered plywood, hardwoods & melamine. 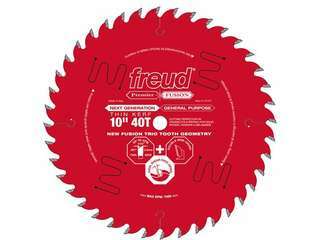 Freud’s Next Generation Premier Fusion featuring the radical new Fusion Trio Tooth Design is the most technologically advanced general purpose blade on the market! 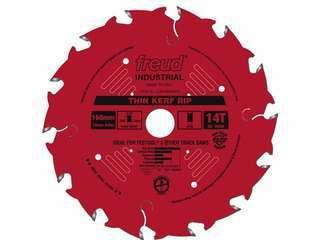 Freud has designed these unique blades with a new radical tooth design called “Fusion Trio” which combines a special grind for the top, sides, and face of each tooth. This one-of-a-kind tooth geometry includes a 30 degree Hi-ATB, a double grind design and an Axial Shear Face Grind to produce the ultimate polished finish in ripping and crosscutting applications with minimal resistance as it glides through in the material. Whether you’re ripping or crosscutting, the next generation Premier Fusion blade is the best for flawless cuts in laminates, melamine, veneered plywoods, hardwoods, softwoods, and thick stock lumber. This one-of-a-kind tooth geometry includes a 30 degree Hi-ATB, a double grind design, and an Axial Shear Face Grind to produce the ultimate polished finish in ripping and crosscutting applications with minimal resistance as it glides through in the material. - QSAW CUTS SAFELY: no excessive dust, fumes, or smoke make for a safer work space. Qsaw blades produce fewer sparks and will run cooler. We put the all the heat in the chip! This will give you an overall safer alternative in your cutting operation. We stock Diablo, Evolution and Q-Saw blades to fit a wide range of saws. Whether you need to cut Metal, Wood, Plastics or other specialty materials, we have the right blades for your cutting needs. From 4 in. to 15 in., thin kerf and normal kerf, High Speed and Low Speed blades, take a look at our wide selection of blades.